Single screw inboards suffer from an inaccurate reputation. Some boaters labor under the impression that controlling a single engine powerboat, particularly in close quarter situations, is an arcane art or esoteric science. Many a mind’s eye must envision a ceremony during which a capricious King Neptune instantly bestows the secret knowledge required to tame a single screw boat to some randomly selected group of old salts, and totally prohibits the rest of the us from ever really catching on. It isn’t uncommon to meet boaters who feel that a twin engine boat is absolutely essential, and some of that set would be nearly helpless if required to maneuver with one of the engines out of commission. Still others would only consider a single engine powerboat if there were bow thrusters, stern thrusters, (or possibly both) installed. Boaters with twin engines can often “power through” situations in a fashion that would be impossible for a vessel with a single engine to duplicate. Even so, understanding the art and science of controlling a single screw inboard will enable any boater to more completely appreciate some of the variables that will affect the handling of nearly all types of powerboats. 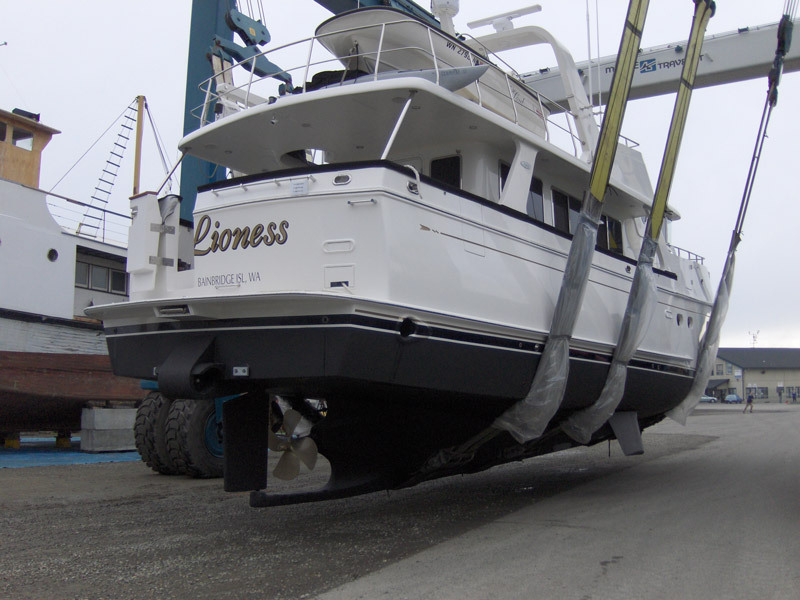 Can a book, a video, or a web site teach somebody how to maneuver and dock a specific, single screw boat? In reality, no. Every boat behaves somewhat differently, and even the same boat will encounter a different mix of variables to sort out in nearly all close quarter situations. The encouraging fact is that while boats behave somewhat differently, there are common principles that govern the successful operation of single screw inboards. Becoming adept with a single screw boat will depend on developing an understanding of the common principles and following up with some intelligent practice. (Practice only makes perfect if one practices perfectly). We will exam some of the basic principles and describe how they can work to the advantage of a boater operating a single engine inboard boat. Galileo and Isaac Newton observed principles that apply when handling a single engine inboard boat. Among them, “A body in motion or at rest will remain in motion or at rest unless acted upon by an outside force,” and “For every action there is an equal and opposite reaction.” Motion, forces, actions, and reactions; four simple words that define the practical parameters of any discussion of handling a single screw. Every boat operates in an unstable environment. The superstructure of a vessel is exposed to air that refuses to stand still and can at times be completely unpredictable. When properly harnessed and in moderate amounts, wind can be a boater’s best friend. Wind can quickly become a boater’s worst nightmare as well, and unless the air is dead calm it will always either assist or impede any boat maneuvering in close quarters. Some boats carry more “windage” than others. Stacking a couple of decks above the waterline, adding a flying bridge, (and perhaps erecting a four-sided sail, a.k.a. “enclosure” around said flybridge) can create a boat with a lot of accommodation and impressive design- but the skipper of such a vessel will learn almost immediately that even a moderate wind will dramatically affect his or her docking decisions. Boats built with less freeboard and superstructure, (such as an express cruiser or a runabout) will conversely be somewhat less susceptible to the vagaries of wind. It is usually true that the shallower the draft of any vessel, the greater the effect of wind upon the hull. It takes less pressure to push a boat through air than it does through water, so the greater the ratio of draft to exposed superstructure the more pronounced the “braking” influence of the water can be. 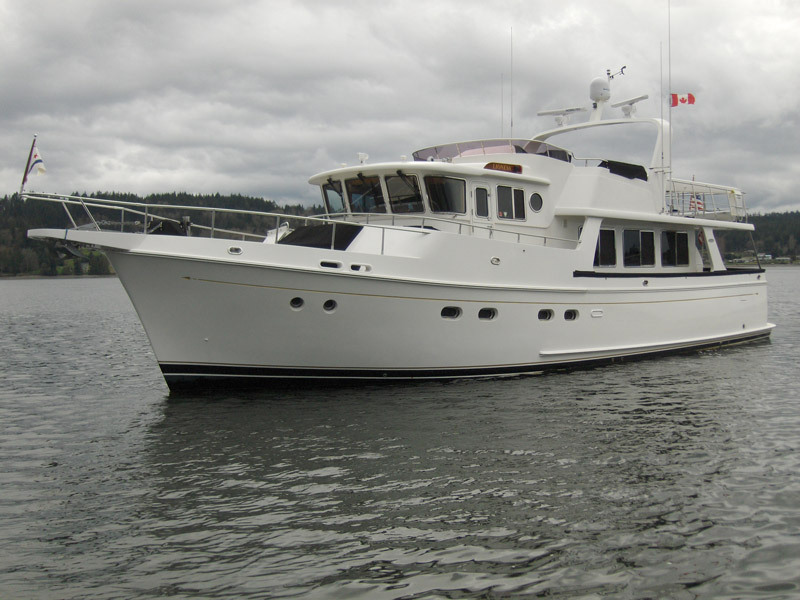 Boats with substantially less draft and more freeboard in the forward sections, such as many trawlers with a semi-displacement hull, may be prone to “losing the bow” in a severe crosswind while the stern is somewhat more resistant to being pushed around. While wind is a factor that must be considered when maneuvering at close quarters, the movement of the water itself (current) will frequently create more challenges for a boater than a gentle or moderate wind. A two or three knot wind might not even cause a boat to tug lightly against its moorings, but a two or three knot current will sweep everything floating therein along at the same speed “unless acted upon by another force”. When a boat is made fast to a dock or float or is riding at anchor, the tension of the mooring line or anchor rode offsets the pull of the current and allows a vessel to remain in place. When underway, powerboats rely on forces generated by mechanical propulsion to equalize or overcome the effects of current. Not only must we deal with the individual challenges of wind and current when handling a single engine inboard, but the two forces will unite in a seemingly endless variety of scurrilous combinations that will prevent many dull moments from intruding into perpetually interesting docking exercises. Dealing with a combination of wind and current while trying to dock a boat may not be entirely unlike trying to maintain balance on an icy treadmill while simultaneously running in place and dancing the hokey-pokey. Wind and current may work together to push a boat away or slam a boat against a dock, or they may work at cross purposes, and in some cases one of the natural environmental forces may declare a holiday and leave all the bedeviling to the other. Effective handling of a single screw powerboat requires that the skipper be well aware of the presence of wind or current, understand the effects of these forces on his or her specific boat, and know how to counter or manage the natural forces with the available mechanical devices and techniques. It can be accurately observed that maneuvering a single screw powerboat, or any boat for that matter, is an exercise in the creation and management of high and low pressures. The primary tools for overcoming (or harnessing and controlling) the natural forces of wind and current available to a single screw boater are all dedicated to the generation and administration of high and low pressures. The most important tool available to a single screw boater is the propeller, including by extension the throttle and gearshift controls that dictate its speed and direction of rotation. When the propeller is activated in forward gear, the rotating blades create a high-pressure area immediately aft of the prop and a low-pressure area directly ahead of it. It is this pressure differential that causes a boat to move forward when the forward gear is engaged. The flow of water across the propeller is known as the “suction current” as it is being drawn into the prop and the “discharge current” once beyond the propeller. Propellers also create pressure differentials on either side. As the blades propeller turn, a zone of lower pressure forms on the “descending side” (where the blades travel away from the hull and toward the bottom of the arc) than on the ascending side. This unequal side pressure actually pushes the stern to one side, even while the boat is supposedly being steered in a straight line. Unless a boater compensates with a continuous series of small corrections with the helm a vessel would travel in a large circle as a result of the difference in side pressures surrounding the prop. Propellers are said to be “right handed” or “left handed” depending upon whether they turn clockwise or counter-clockwise when in forward gear and viewed from astern. A prop that turns clockwise is known as a right-handed propeller, and is more commonly encountered than the counter-clockwise turning left-handed variety. Whether a propeller is right or left-handed will have a profound impact on the strategies and techniques adopted by single screw boaters. Some mariners refer to a propeller as a “wheel”, and this image can be very useful when envisioning the effects of propeller side thrust while operating a single screw. Imagine that instead of a propeller, a boat were fitted with a wheel and tire on the end of the prop shaft and sitting on the hard rather than floating in water. A right handed wheel would turn clockwise in forward gear and carry the stern of the boat to starboard, while a left handed wheel turning counter-clockwise would carry the stern of the boat to port. Single screw boats steer around a “pivot point”, commonly about 1/3 of the way aft from the stem. Anything that sets the stern to either port or starboard will set the bow in the opposite direction, but the bow is pivoting on a much shorter radius than the stern. The management of high and low pressures against the rudder allows us to steer a single engine powerboat. Water must be passing across the rudder in order for the rudder to have any effect. The passage of water can be generated by the discharge current from a propeller, or by a vessel simply moving through the water with headway or sternway. When the rudder is amidships, the discharge current from the prop or current from headway flows equally along both sides of the blade and the stern is not forced to port or starboard. When the wheel is turned to port, the rudder rotates to place high pressure against the port side of the blade. The discharge current and the current generated by headway move the stern of the boat to starboard, changing the heading of the bow (beyond the pivot point) to port. The reverse principle is true, of course, when steering to starboard. One of he first and most important concepts that new boaters need to appreciate is that the boat is not steered by the bow, but rather by the stern. Due to unequal radii to the pivot point, any change in heading observed at the bow must be created by a far greater amount of movement astern. One of the popular comparisons suggests that maneuvering a boat is much like steering a supermarket shopping cart with fixed front wheels and pivoting wheels in back, but a shopping cart will pivot around the “inside” front wheel while a boat is spinning on a point about 1/3 of the way back from the stem. Another useful comparison is steering a wheelbarrow. To make a left turn with the front of a wheelbarrow, the handles must be take to the right. If handling a single screw powerboat is really at all similar to pushing a shopping cart, it would have to be a shopping cart in a grocery store with narrow aisles, slippery sloping floors, and one with the roof torn off just a few moments earlier by a tornado. We have identified the natural forces that we must consider when operating a single screw inboard powerboat and taken inventory of the primary mechanical tools we have to harness and/or overcome those forces. In the next installment we will begin solving the mystery of when and how to apply the mechanical forces in order to cause a single screw powerboat to react as desired; most of the time. We will also examine how to recover and when to start over when the best-laid plans come akimbo and several dozen dock-walkers are being entertained by a particularly lubberly and clumsy performance. (Please don’t ask me how I know).